Born in Winnipeg, Carla Lehmann was the youngest of five children of Julius and Elsa Lehmann. Her father was a prominent surgeon and on the board of governors of the University of Manitoba. Their young daughter — the youngest of fice children — did well at school and was an honours student at Riverbend Girls’ School (now Balmoral Hall), where she edited the school newspaper. Through her teens she performed at piano recitals and at 15 began acting with the Winnipeg Little Theatre. After graduating from Riverbend in 1933, she spent a year at Rupert’s Land Ladies’ College and from there decided to move to London, England. She shared living accomodations with a classmate while attending the Royal Academy of Dramatic Art. A year after she joined the Croydon Repertory Company she began landing roles and appearing on the London Stage. She made her first on-screen appearance, a bit part in 1938 and made what is usually considered to be her screen debut in a more substantial role in the Stewart Granger feature, So This is London. In addition to film, she spent most of her career on stage. One example is her role in the production of Agatha Christie`s Appointment With Death in 1945. Trivia buffs may be interested to note that she shared the stage with a young Joan Hickson who in later life would portray Christie’s most famous character, Miss Marple, in a highly popular TV series. 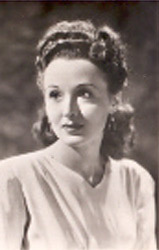 In 1947 Lehmann took a break from acting to concentrate on her personal life. She had married her second husband, John Townsend, and they had two sons named Anthony and Nicholas. When she resumed her acting career in the early 1950s, it was primarily in television dramas. The final decades of her life are a mystery. Carla Lehmann was 73 when she died in England in December 1990. The image below was scanned from an original promotional glass slide in the Northernstars Collection. 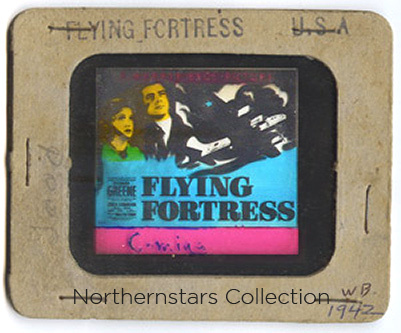 This image of a glass promotional slide for Flying Fortress was scanned from an original in the Northernstars Collection.